Greta Thunberg at a rally in Finland. Greta will be attending this year’s COP and participating in a number of ScientistsWarning.TV interview videos. Greta’s campaign is known on social networks as #FridaysForFuture and @FridaysForFuture. In hopes that no one would notice, the Trump Administration released the Fourth National Climate Assessment on Black Friday at 2 p.m.
Trump may have turned his back on the Paris Accord but the U.S. Government is full bore on climate change abatement. 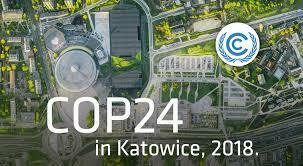 Somehow perfect timing was had when the president released the report one week (five business days) before the Katowice Climate Change Conference commences on December 3. Excellent timing for the gathering of about 30,000, including Stuart Scott, Rob Harding and Rob Moir with Scientists’ Warning. More than 300 federal and nonfederal scientists worked on the report for three years, which was reviewed by 13 federal agencies. With this report, the U.S. Government directly contradicts the Trump Administration. The White House should stop the malpractice of rolling back climate policies and recognize that a much larger-scale response is required to essentially keep people safe. Damaging weather has cost the U.S. nearly $400 billion since 2015, and those costs are only expected to increase. Heat-related deaths could cost up to $141 billion, sea-level rises could cost $118 billion and infrastructure damage could cost $32 billion by the end of the century. The loss of the recreational benefits alone from coral reefs in the United States is expected to reach $140 billion by 2100. “Serious consequences like collapsing coastal housing prices and trillions of dollars in stranded fossil fuel assets await us if we don’t act,” said Senator Sheldon Whitehouse. Stuart Scott, Rob Harding, and Rob Moir will attend the Katowice Climate Change Conference, December 3 to 14, 2018. Scientists’ Warning videos are being scheduled. Stuart will interview Victoria Hurth, Greta and Svante Thunberg, Anders Wijkman, Dan Galpern, Kevin Anderson, Tony Juniper, David Beerling, and John Rockstrom. Stay tuned for further details and complete information on Stuart’s guests, as well as updates on the climate change conference. In a conversation on YouTube, Stuart Scott challenged Guy McPherson’s belief that humanity will face extinction by 2026. Guy ticks off the impending calamities that will reinforce each other to soon cause the sixth extinction. Stuart deconstructs his critique and gives rise to hope for the united efforts of humanity when survival is at stake. In part 2, Guy McPherson declares civilization is the problem. It’s a heat engine that will be responsible for our demise. Stuart argues, no, it is our consumption mind-set and economic system that are at fault. Stuart points out the valor to protests, marches and civil disobedience. Guy counters it may help people feel better, but does nothing for the power-centers at fault. ‘The Elephant Has Left the Room’ is the title of Rob Harding’s piece at ScientistsWarning.org. Rob’s piece has been picked up and posted by the Rewilding Institute Website. Rob addresses the problem of human overpopulation with a proposal for a UN framework convention on population. Drawing on the five principles of universality, proportionality, equity, equality and choice, a three-pronged solution is presented. Formal recognition by the UN of existing human overpopulation and the pursuit of sustainable populations in every country would be a significant international step toward addressing both the elephant and troubling global ecological trends.